Solibri, Inc., the leading supplier of BIM QA/QC solutions has released new versions of the free Solibri Model Viewer and Solibri IFC Optimizer. Both solutions are now distributed as installable software packages as opposed to the earlier Java Web Start technology making distribution easy and efficient. Both solutions include also new auto update functionality that automatically checks for new versions at the frequency specified during the installation. Both solutions are available for 64 and 32 bit Windows, and Macintosh operating systems. The new Solibri Model Viewer includes several enhancements such as a measurement tool, and the capability to both receive and send design information in BCF format. Solibri Model Viewer now accepts design and BIM coordination information in BCF format, and is able to create and send comments for use in design coordination and collaboration. Also, comments can now be added to BIM checking results generated by Solibri Model Checker enabling design management and BIM teams make more informed and better decisions. With the new Solibri Model Viewer capabilities Solibri delivers to the AEC community the most comprehensive design coordination and collaboration BIM QA/QC process and work flow support. Solibri IFC Optimizer is a free tool for optimizing Open Standard IFC files. Optimization reduces the BIM file size making model distribution and model load times faster. In the new Solibri IFC Optimizer both optimization speed and efficiency has been improved increasing productivity in design work and model handling. BCF (BIM Collaboration Format): is an open information transfer format enabling different design software to exchange design information. 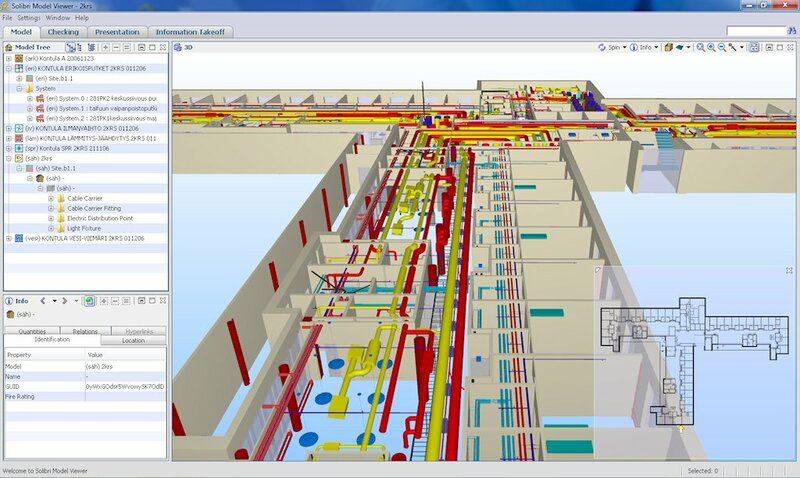 The format has been developed by Solibri, Inc. and Tekla (now Trimble Inc.), and is being implemented by several major CAD software companies. The format is available to any software developer wishing to enhance design software collaboration and design information exchange.